Salem, OR (July 11, 2018) – Locally-owned South Salem Ace Hardware has been officially EarthWISE certified by the Marion County. South Ace earned the designation by implementing several environmentally-friendly practices such as recycled paper towels and toilet paper, a battery and technology collection system and an expanded mixed recycling program. Alan Pennington, the Waste Reduction Coordinator at Marion County Public Works Environmental Services, who administers certifications, was impressed by the Ace’s efforts to lessen their environmental impact and commit to sustainable practices. “Their attention to reducing waste and conserving resources is just as great as their attentive customer service.” said Pennington. In the wake of a growing movement for green practices, Ace wanted to do its part. These efforts will help the hardware store reduce their costs and as well as their environmental impact. Store owner Matt Haddad is looking forward to adopting the new standards. South Salem Ace Hardware is located at 706 Madrona Ave. SE, Salem, OR 97302. acesouthsalem.com, (503) 763-6323. 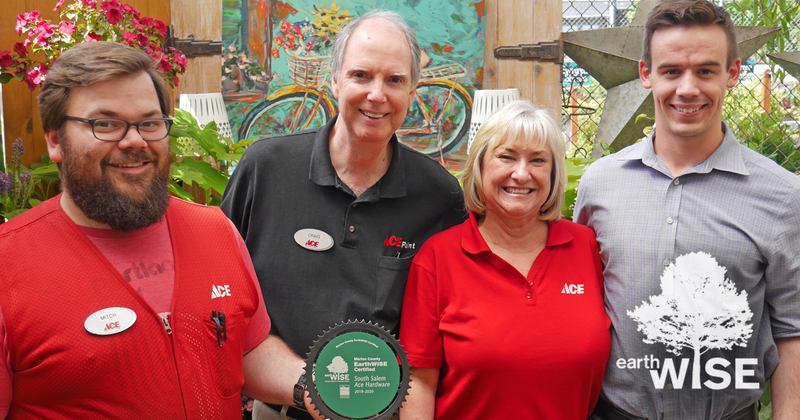 About South Salem ACE Hardware: Independently-owned South Salem ACE Hardware is located at 706 Madrona Ave SE. (next to Epic Fitness). Acesouthsalem.com, (503) 763-6323 for more information. Each ACE Hardware store is locally owned and operated. About Earthwise Certification: If your business wants to become Earthwise certified, please contact Alan Pennington with Marion County Public Works at 503-365-3188 or email apennington@co.marion.or.us.